U.S. Speaker of the House Paul Ryan, center, greets Kaleb Case, right, a descendant of the founding Case family. Wisconsin Speaker of the State Assembly Robin Vos at left. ARTBA member CASE Construction Equipment celebrated its 175th anniversary this week with a rally at the company’s Racine, Wisconsin, headquarters. 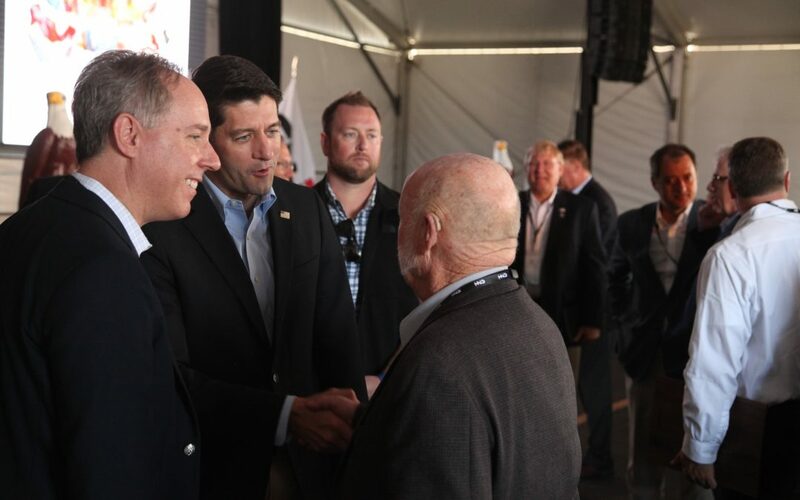 More than 800 employees and guests attended, including U.S. Speaker of the House Paul Ryan (R-Wis.) and a descendant of the founding Case family. The company was founded in 1842 as the Racine Threshing Machine Works Company. It grew into one of the world’s most iconic manufacturers of construction and agricultural equipment. The company’s Dire States initiative has helped to raise awareness about the need for a permanent revenue solution for the Highway Trust Fund, and also provided construction equipment grants to help communities offset the cost of building or repairing critical pieces of local infrastructure. See more photos and the full news release at the company website.